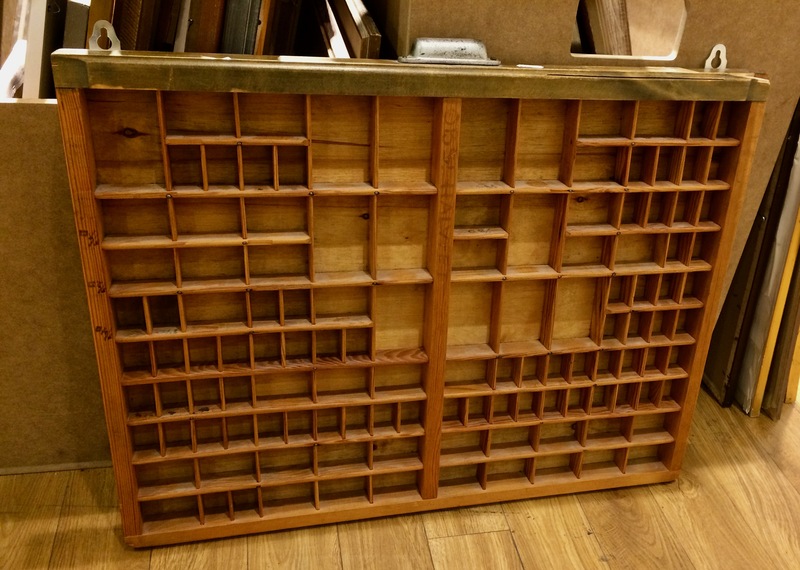 I trained as a journalist from 1979 onwards, so I have always had printers’ trays (or printers’ drawers as they are also called). 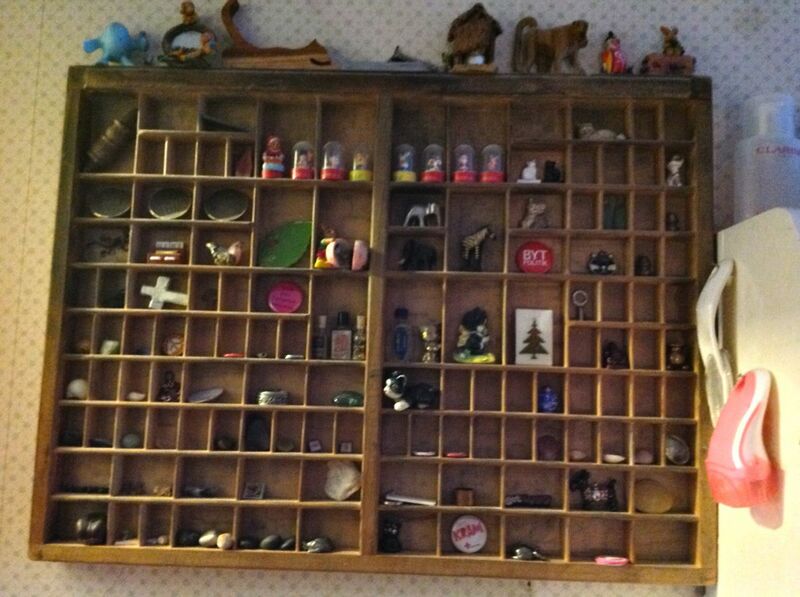 We actually used them in those days and I used to take any old drawers they threw out and use them for display. These two I bought here in Sweden – they still have the old metal letters in some of the drawers. 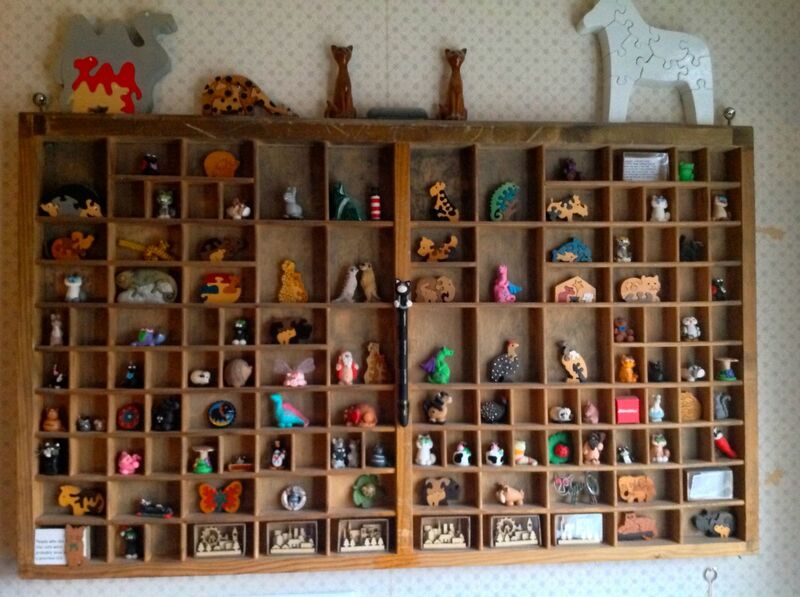 The top one holds all my clay animals and African matchbox puzzles. The bottom one holds mementoes – from stones and shells picked up on special beaches, to tiny snow globes and Russian nesting dolls. Someone asked me the other day what they were. 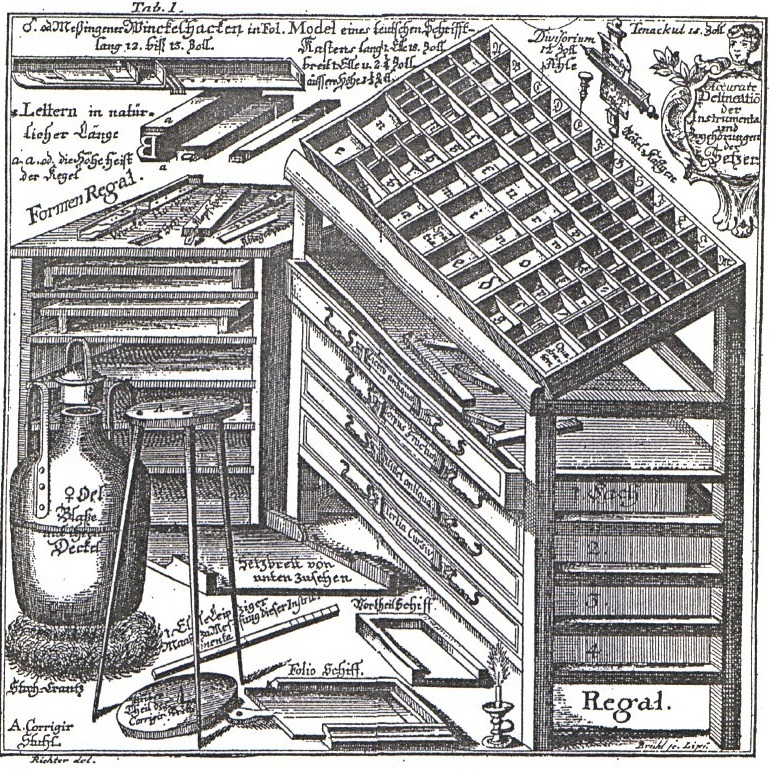 These are drawers from from so-called ‘type cases’, where the metal letters used for printing text were used. You had to lay out everything by hand in those days. 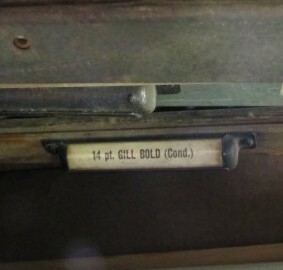 The ones I worked with had the typeface and size labelled on the front of the drawer, but there were many different designs. 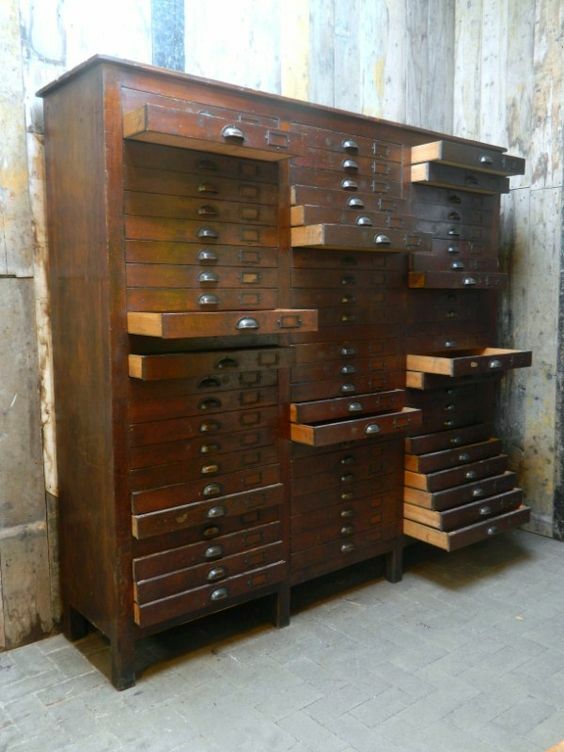 With most of them, you could lay the drawer on top of the case. Upper case letters are so called because capital letters were kept in the upper part of the case, while the lower part of the case held the smaller (lower case) letters. Moreover, the saying ‘mind your Ps and Qs’ comes from typesetters warning their apprentices to not confuse the p and q letters when setting the type. 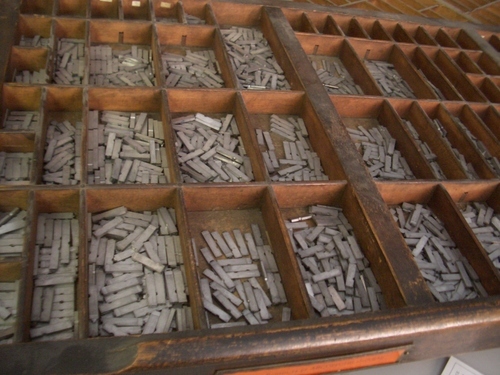 Modern, factory-produced movable type was available in the late nineteenth century. 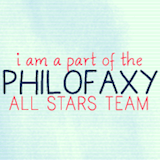 It was held in the printing shop in a job case, a drawer about 2 inches high, a yard wide, and about two feet deep, with many small compartments for the various letters and ligatures. 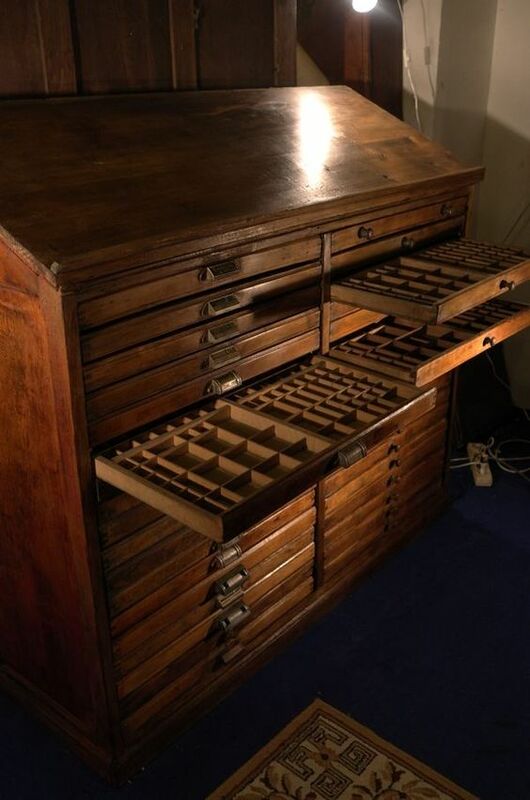 Traditionally, the capital letters were stored in a separate drawer, or case, placed above the case holding the other letters (this is why the capital letters are called “uppercase” characters, and the minuscules are “lower case”).